Last night on The Bachelor, Brad Smith sent home another 4 girls in his attempt to purge the multiple duds that he was given on his quest to find Mrs. Right. I look at the crew that he has left and I am thinking…THIS is what he has to choose from? Oh dear lord, I can see the headlines now, "Canada's first pass at finding love – over in 71 days – take THAT Kim Kardashian" This is not in reference to the fact that one of the girls still hanging out at the mansion is a former GF of Kris Humphries…it just that, there is no way any of these girls are prime material. First Brad sent Laura B packing after his double date with her and Bianca…this should surprise no one because she did have a melt down in week two AFTER SHE ALREADY GOT A ROSE. He is thinking "Holy insecure much?!" and I am thinking…that is probably only the beginning. Nice girl, but…woah. Then Chantelle gets a call from her dad and immediately the super annoying voice comes back (which I thought we were rid of after week two – she started to bring it down from decibels only dogs can hear to a more normal level.) I was like, SHUT THE F-CK UP. And then he told her that her Grandpa died – and of course I had a momentary 'bad karma' alert, which passed as quickly as it came. She cried and then decided that she was going to go home. Here is the thing with that – could she not have just gone home for the funeral and came back? I don't understand this. People have left the show and went home being like "I'm outta here forever, peace" and then were let back on the show…so why not say, 'um hey – my Grandpa died I need to go to his funeral' and then come back? I think that this was just a nice way for them to get her off the show – Brad probably didn't want to come off like an a-hole for kicking her off the week after she told him she had her V-Card still safely in her wallet. Have you seen his tattoo? Not sure that is what he is looking for. Two down, two more to go. Whitney gets a one-on-one date (decided by Brad before Chantelle left) after she 'snuck over to his house (with a camera man)'. They sat down for a chat and he started going off about his friend that committed suicide and his sad life and stuff…all while crying. Whitney sat there with her normal "you can't see my eyes because my eyebrows are so big, but don't worry because they are expressionless anyways' look and then when he was finished she said, "I better get that one-on-one date." In her defense, his whole thing was pretty out of left field and I would have been super uncomfortable. 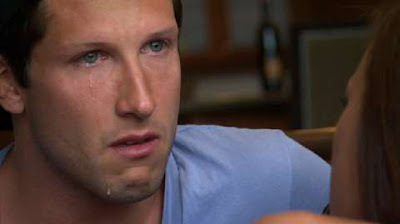 The only time I am OK with people crying is during sad movies (Armageddon, Bambi, The Notebook) and Tim Horton's commercials, because that is generally the only time I cry – so I understand. 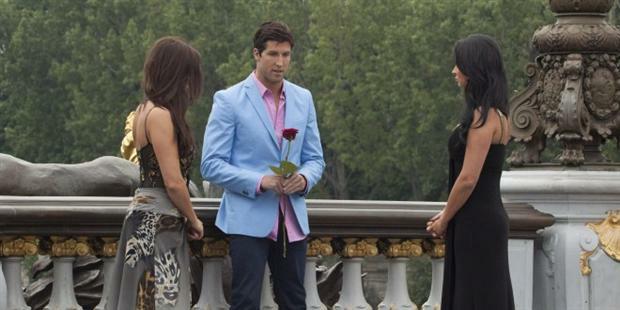 Whitney gets her date, then she gets her rose. On the only group date Britany tried to grab a pity rose by telling Brad a sob story about her family. Clearly this made him uncomfortable and he probably already had it set in his head that he was going to send her home so he didn't give a rose to anyone. That should have been a hint that she was not going to get one in the rose ceremony. And what do you know, she didn't. Ana and Britany were given the boot at the rose ceremony with Gabrielle and Kara receiving the last two. So now we have Kara, Bianca, Whitney and Gabrielle. I am still convinced that Whitney and Gabrielle sticking around is the producers doing, but you never know. At this point I don't have a favourite of the group. Next week is the 'hometown dates' which means the show will be in Calgary, AB; Delta, BC; Mississauga, ON and Oakville, ON. Fun. Times. Side note: anyone else notice that we are only 4 weeks in and we are already down to 4 people...this is going to be the shortest season of the Bachelor ever. YOU ARE SO MEAN TO CHANTEL.